We love our feline friends like family. They comfort us when we’re sad, entertain us with their antics, and keep us warm when the weather turns nippy. Kit ‘N Caboodle embraces our furry companions and all of their moods. 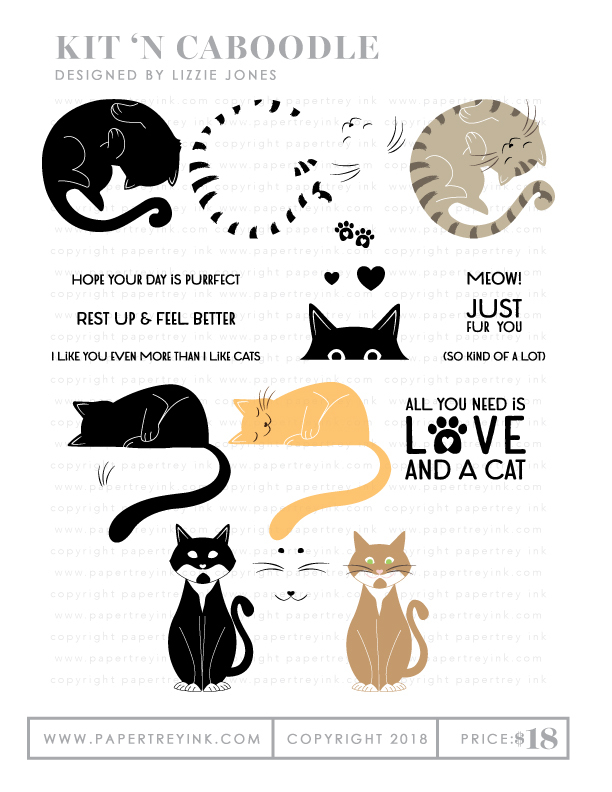 This set includes four playful tabbies and a variety of sentiments useful for get well, birthday, friendship, and more. 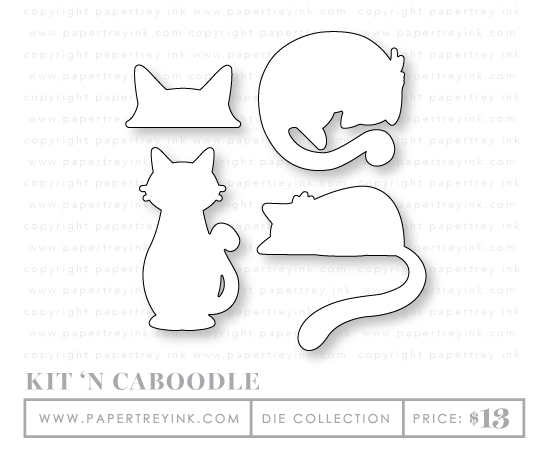 If you or someone you love has a kitty companion, this set is sure to be a necessity for you collection! STAMP DETAILS: This stamp set comes on one 4 x 8 acetate sheet. The “All you need is love…” sentiment measures 1 ⅔” wide by 1 ⅛” tall. The “rest up…” sentiment measures 2 ¼” wide by just over ⅙” tall. The assembled back sleeping kitty measures just under 2” wide by just under 1 ⅞” tall. The assembled belly sleeping kitty measures 2 ¼” wide by 2 ⅛” tall. The assembled peeking kitty measures 1 ½” wide by just over ¾” tall. The assembled tuxedo kitty measures 1 ⅛” wide by 2 ⅓” tall. This die collection coordinates with the Kit ‘N Caboodle stamp set. This Sentiment Staples: Thinking Of You stamp set is the sixth in a series of basic essentials for both new stampers and more experienced crafters alike. The font options of the three medium-sized greetings offer flexibility to accommodate a variety of styles while the selection of companion sentiments gives you the freedom to personalize your greetings. This set focuses on sending thoughtful notes, both uplifting and encouraging, to the people you love. Pair these sentiments with images in your collection to freshen up well-worn stamps and give your favorites new life. STAMP DETAILS: This stamp set comes on one 3 x 4 acetate sheet. The block “Thinking Of You” sentiment measures just under 2 ½” wide by ¼” tall. The more formal script sentiment measures just under 2 ½” wide by just over ½” tall. The casual script sentiment measures just under 2 ½” wide by ⅔” tall. The “during this difficult time” sentiment measures 2” wide by just over 1/10” tall. The “and smiling” sentiment measures ⅞” wide by 1/10” tall. The “on your special day” sentiment measures 1 ⅗” wide by 1/10” tall. Each of the Shape Shifter dies consist of three different dies that can be interchanged with the other similar shapes within the Shape Shifter collection. New Shape Shifter sets will be introduced each month throughout the year. 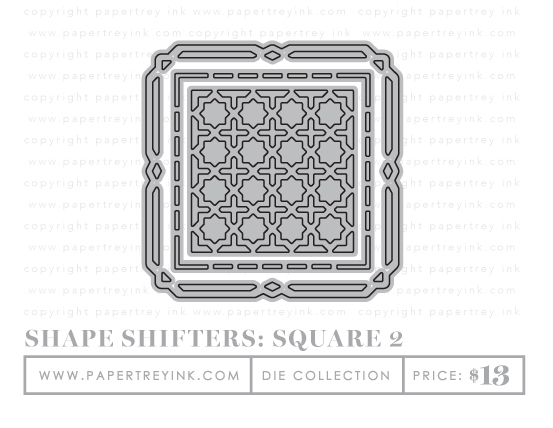 Mix and match the Shape Shifter: Square 2 interior geometric design, dashed border, and outer frame with the other Shape Shifter Square dies in the series for lots of design options!